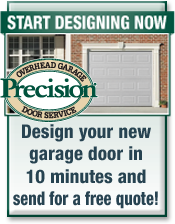 Click Here to Design Your Garage Door Online in Minutes! # 1: Which Is The Best Garage Door? We are often asked this question and the simple answer is the best garage door is the one that most closely meets your needs. You should choose a garage door manufactured by a quality company with a good reputation and installed by a professional. 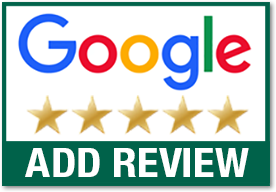 We sell and professionally install new garage doors that offer quality, durability, and warranties that provide the most substantial value to our customers. 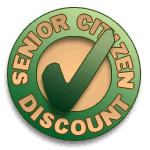 Then, we work hard to understand your individual needs and recommend the right door for you! Learn more about the styles of garage doors that are available. 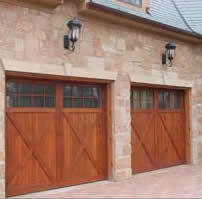 Steel is the most popular material used for garage doors today because of its durability. Steel will look great forever and is virtually maintenance-free. It also has the advantage of being the least expensive garage door you can buy. Radically beautify your home with wood carriage house doors. These doors increase the curb appeal of your home so much that real estate studies have shown they increase the value of your house, but that's not the real reason to have them. The real reason is just how much you'll love the way the exterior of your home looks. And if the neighbors are a little jealous, well, that just can't be helped. In addition to the above styles, you may also consider doors that are unique and offer options to match your home's design. These doors can reflect styles from old world doors, with decorative hand-forged hardware and architectural glass options. They can be customized with gorgeous woods such as mahogany, hemlock and cedar. You can also find contemporary and modern styles in materials such as copper, aluminum or glass. Precision will work with homeowners, architects and designers to help match your Garage Door to your home's unique style. Composite doors are just above steel in terms of price. They come primed and ready to paint with a limited lifetime warranty. People buy wood-composite primarily for 3 reasons. The first is wood-composite can easily be customized for your home because it requires painting. The second is that once it is painted it does not require the maintenance a wood door will, nor will it crack, split, swell or warp like wood can. And lastly, this environmentally friendly door is made mostly from recycled material so it is the "greenest of garage doors." Precision Garage Door of Des Moines offers a large selection of garage doors in many styles and panel designs. Call us now and get a free quote on any style of garage door. Looking for a more modern design? Mosaic windows and full view aluminum doors offer a nearly endless variety of styles that bring more light to your space. For 24-hour Emergency Service, please call now!